Product tours are the new standard in guiding users towards their "aha" moment, or in showcasing high-value features that are being under-used. They can be much more successful than emails or other channels in helping your users take actions that will benefit them. When someone signs up for your product, they are excited to play with it and are often not prepared for long introductory tutorials. Showing a tour as soon as they land inside your product for the first time will often be met with resistance (they will seek to close / dismiss it). They typically want to get a "lay of the land" with your product before they are ready for guidance. Ask whether users are interested in a tour as the first step. Use less-invasive step design (e.g. don't cover the whole screen) unless you want to force a user through a tour. People learn by doing (there have been many studies on this, such as this one), so giving users a chance to implement your guidance is critical. Long tours increase anxiety because users worry they have to ingest a lot of information before they can use it. Don't try to teach everything. Pick a single user action as the goal, and create a 2-3 step tour to convince a user to take that action. Have many smaller tours rather than a single long tour. You can prioritize and sequence tours. Make all copy (your #1 lever!) benefit- / value-focussed. Users should feel thankful after seeing your tour. It should not be annoying or draining in any way for them to complete your tour. Don't ask them to undertake lots of work to get value, instead surprise and delight them with additional information that they would not have otherwise gleaned from your interface. Users are 4.5x more likely to complete a second tour if they complete the first instead of exiting it. If they don't find your tours valuable they will exit and be less open to further teaching in future - so it's vital you don't reduce your credibility by building bad tours! Review your tour: did you enjoy going through it? Ask teammates. You can publish a tour to just your staging environment by using our URL matching. Assess how well tours are performing - make sure you have connected your analytics provider through our integrations or API so you can see performance data. You can use 'Customer Effort Score' surveys (more specific and actionable than NPS) to measure user satisfaction with a particular UX. To do this with Chameleon, talk to us. Although it's natural to want to pull your users through all of the hoops you want them to jump through, using product tours to do this WILL fail. You cannot force a user to use your product and highlighting everything you want them to do is a bad way to encourage engagement. Instead focus on motivating users to take the actions that will help them (and increase engagement). Often users will figure out how to do certain things if you can convince them why they should do this. BJ Fogg's model on behavior explains that people take action when they are motivated, they have the ability and they are triggered, so you need a combination of all three of these. Focus your copy on explaining why a user should take certain actions; what value will they gain from doing so. Use tours to highlight the most fundamental aspects of your product. For other ancillary features, use single-step tours as signposts. Traditionally user onboarding was a set-and-forget project; teams would spend weeks overhauling the UX, shift focus away and then repeat after 9 or 12 months. This is as inefficient and ineffective as waterfall software delivery; that's been replaced by agile methodology, and products like Chameleon enable you to do the same for product tours. Once you've built your tour, you should focus on collecting and analyzing the data, and iterate on this until you're satisfied with the outcome. Be outcome, not output, driven. Focus on a key quantitative goal and continue to focus on improving your product tour until you get there. Set a conversion goal, beyond the completion of the tour. Chameleon lets you track goals (such as clicks) without writing any code. Provide clear accountability to someone on your team to own product tours and be responsible for regular updates. Read more on creating high-performing tours with our in-depth guide. Heap is a product analytics platform, and the first-time setup is a more complex than something you just use like Dropbox or Gmail. It's B2B sofware that needs to be configured for your product, so ships as an 'empty bucket' that the user has to invest in. 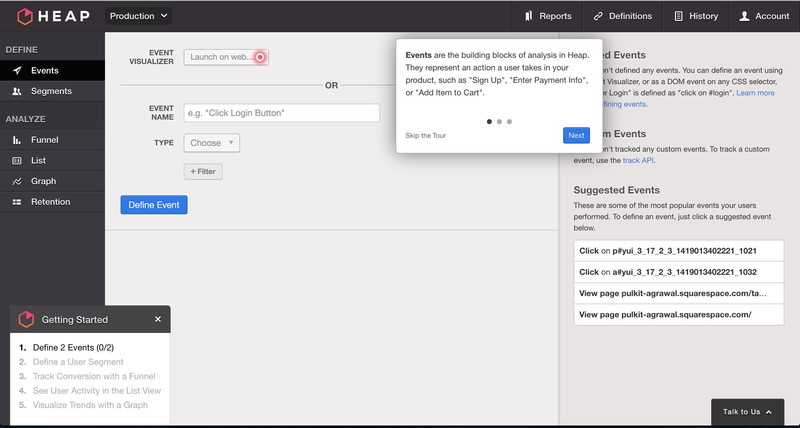 To reduce friction and help users make it through the rocky first mile, Heap built its product tour to coach the user through tasks that make its product's specific capabilities clear: set events, segment users, track conversions, and build reports. Its tour has two interlinked parts – a user onboarding checklist and hotspots that trigger tooltips, showing the user how to complete each checklist task. Typeform is new-generation Forms software; a Swiss army knife that can be used for lead generation, event registration, IT incident reports, fun office quizzes, and more. Because it's so open-ended, Typeform's product tour branches depending on whether the user wants to start from scratch or use a template. The templates offered are a masterclass in Typeform best practices. They use advanced features like logic jumps and custom branding to cement the product's possibilities in the user's head and coach the user to make successful forms. For Typeform, the pre-made forms themselves act as the product tours – sequential, educational, and driven by tangible examples. We are familiar with the explosive growth Slack has had, and a big component of it was how easy, friendly and fun it was to set up at the beginning. 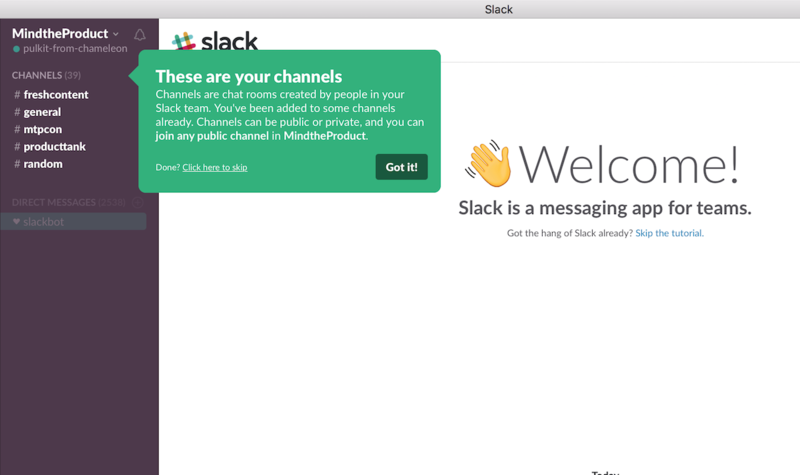 Slack uses bright tooltips, personable copy in its now-legendary product tour. The series of tooltips highlight public channels and direct messages to help the user understand the differences, benefits, and product terminology. As well as clearly communicating brand personality with a laid-back tone, the product tour gets you chatting with a bot straight away to instantly teach you the core mechanics. Check out the video below to see how to create Slack's user onboarding experience in Chameleon! It looks delightfully like it was built by Fisher-Price, but Airtable is a very complex product that condenses the power of an SQL database into something as simple as Google Sheets. To simplify that inherent complexity, Airtable's product tour shows snippets of high-level information and practical gifs on a self-serve basis. The multicolored row of icons in the bottom right each represent one part of the tour and highlight a specific feature with its core benefit and a call-to-action. We believe you can create great product tours and that can drive lots of happiness for your users and great engagement for you. It requires you to take onboard some of these lessons and then begin testing and iterating with your product and users. We're always happy to help - if you would like to speak with a product specialist on what product tours you should be building based on your goals, then let's talk!